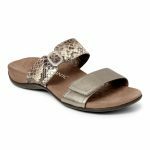 The Vionic Camila is an adorable and adjustable sandal that features a metal trim detail hook-and-loop closure on the straps. Walk, move, and live with the Camila. The Micro-fiber footbed covered in EVA will feel superior on your feet. 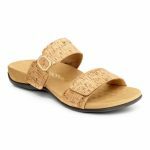 The classy look of this sandal will have your friends asking where you got them from!